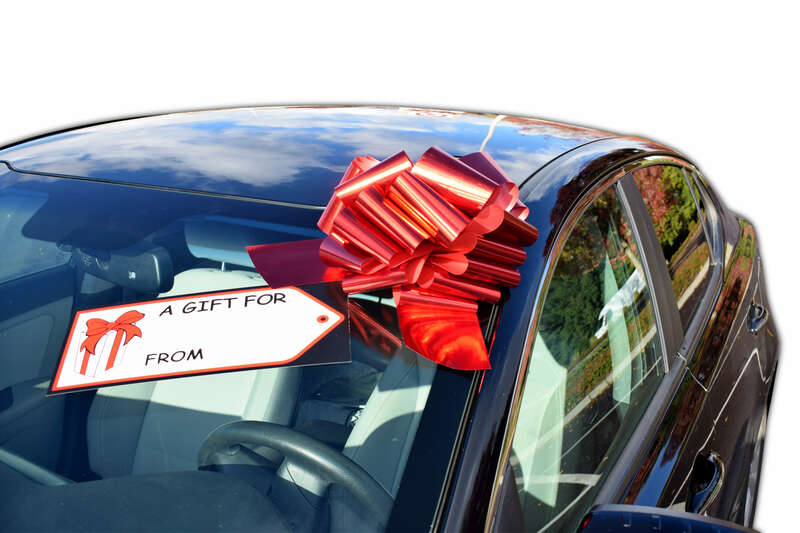 Our giant car bow ribbon gift tag combo is the perfect finishing touch for your special extra large gifts. This unique bow and tag combo is perfect for car and truck windshields, RV’s, home appliances, large children gifts, motorcycles and more! BEAUTIFUL car bow. Main Bow is 14 inches wide and 8 inches tall. Two tails are 9 inches long. Made with 4 inch wide glossy thick PVC Ribbon. INDOOR and OUTDOOR use for this weather resistant bow! Use for multiple occasions! Easy to Store! SAVE MONEY with this economical large bow. EASY to assemble. Simply pull two inner ribbon strings to assemble. Bow pulls into 20 separate loops with two tails within seconds. Directions are included in your package and are available on our website. ATTACH to anything. Completely safe use for cars with our heavy duty NON-SCRATCH suction cup to attach to cars, appliances, bikes, graduation gifts, joke gifts, or anything oversized! SPECIAL touch with a vinyl sticker gift tag. Sticker wont rip or leave residue. GUARANTEE if you aren’t satisfied with purchase, please contact us for a replacement. We are happy to ship a FREE replacement out, or you get your money back! This giant car bow ribbon gift tag combo kit is ideal for in home use, indoor and outdoor decor, and gift wrapping. Suction cup attachment makes it easy to display to glass but can be used on any surface. Available in red, blue and green. Ships same business day with delivery in 1-5 days anywhere in the continental USA. BER Flags and Bowz, INC is a leading provider of car dealership and real estate products. Check out our Merry Christmas JumBow, our Happy Holidays JumBow, and our beautiful Surprise JumBow for more gorgeous bow options. BER Flags and Bowz, Inc also sells dealership key tags, custom flags, and real estate flags and balloon clusters. email us at rebecca@carbowz.com or give us a call at 888-509-5734 to learn more today!